Raising funds to purchase toys for our clients. 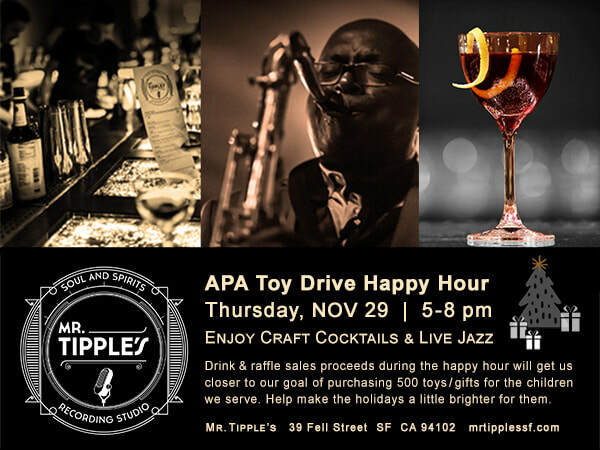 Please join Urban Fam (APA's young professional group) for craft cocktails and live jazz. Our goal is to raise $10,000 to purchase 500 toys/gifts. We accept donated, new, unwrapped toys, too. Thank you! Great raffle prizes, music, food, drinks, and drinking games. Donation proceeds will come from drinks ordered during our happy hour time. Please help us reach our Toy Drive goal. Please CLICK GIVE online to our donation page if you prefer to donate directly online.